Tambo, a rural town, was the administrative centre of the former Tambo Shire. It is on the Landsborough Highway, 90 km south-east of Blackall and 580 km west of Bundaberg. The historic route to Tambo was to travel from Rockhampton to Springsure and then along a track that skirted the north-west outcrop of the Carnarvon Ranges. The Tambo area was explored by the New South Wales Surveyor-General, Thomas Mitchell, in September 1846, and he named Mounts Blunt, Birkhead and Windeyer which are north of the town. He described the Barcoo River and the grazing plains in favourable terms. Twelve years later Augustus Gregory travelled through Tambo, but could find nothing to match Mitchell's description. Drought had dried up the Barcoo. Nevertheless pastoral settlement moved inland from Rockhampton, and nearly all the land around Tambo was taken up for grazing in the mid-1860s. 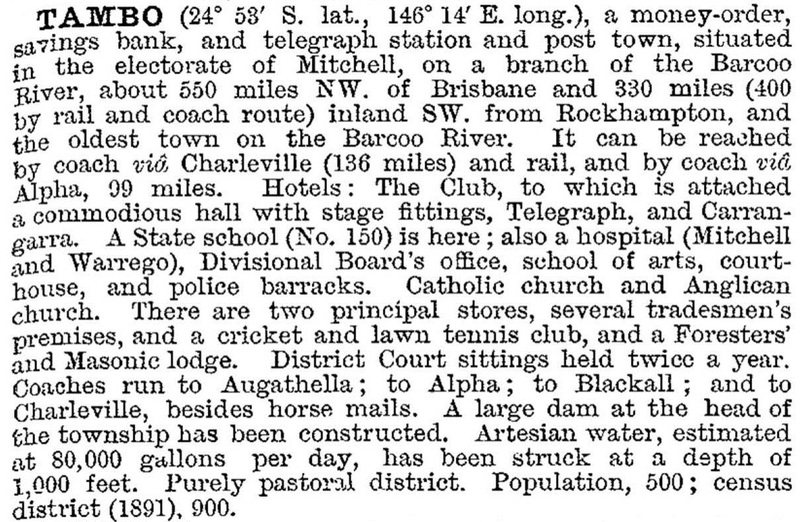 A settlement formed downstream of several Barcoo watercourses in 1863. There were a Tambo Inn and the Tambo Creek, but the origin of the name is uncertain. The Royal Carrangarra Hotel (1865) and the Carrangarra post office (1866) suggest another possible town name, but the post office was renamed Tambo within a couple of years. The town was properly surveyed in 1861. The Landsdowne pastoral station, formed in 1876 by the acquisition of several leaseholds, was one of the largest in the district. About 30 km south of Tambo, it is on the headwaters of the Warrego (Murray Darling system). Tambo thus has the distinction of being on a divide between two major river systems. Town electricity from a local power house was switched on in 1954 and a new shire hall was built in 1957. Buildings were either built to last or the townspeople were careful not to knock them about. The old Tambo post office (1876), the courthouse (1888) and Queensland National Bank all survive, although the bank's business was resurrected by local initiative as a branch of a building society in 1996. For tourists there are a Barcoo River walk, a town heritage walk, two hotels, a motel and a caravan park. The old post office and court house are listed on the Queensland heritage register. There are also bowls, golf and racing venues, and aquatic centre and an annual garden competition. The school is P-10. Further afield there is the Salvator Rosa National Park in the Carnarvon Ranges. 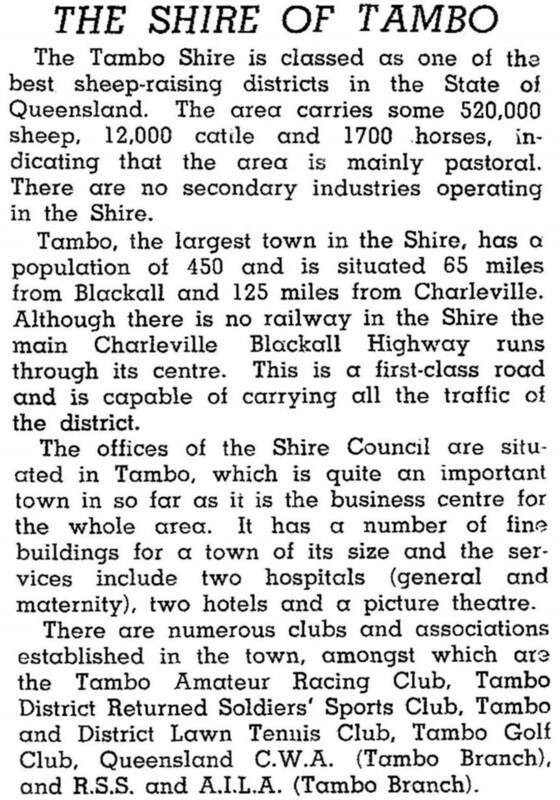 Tambo Shire had an area of 14,105 sq km. It was exclusively pastoral and in 1993 had 365,000 cattle and 293,000 sheep and lambs. The sheep industry has generated a local business, Tambo Teddies, teddy bears made from sheep skin and wool. In 2008 Tambo Shire and Blackhall Shire were amalgamated to form Blackhall Regional Council.